We're throwing vegetables at short guys in masks in this episode, as we review Super Mario Bros. 2 on the NES! This is the second of a three-part series on the NES Mario trilogy. Next month we'll be finishing the series with Super Mario Bros. 3, so come play it and talk with us about it, and we'll include your thoughts in the next NES Classic review episode! Join the event here: https://cheerfulghost.com/Travis/events/172/cheerful-ghost-games-club-super-mario-bros-3 We're throwing vegetables at short guys in masks in this episode, as we review Super Mario Bros. 2 on the NES! YEAH DUFFER BROTHERS! OH WAIT THEY ARE BROTHERS TOO JUST LIKE MARIO BROTHERS! You ever notice that the weird fungus stuff growing all over the Upside Down looks just like the fungus stuff that grew all over Dinohatten in the Mario Bros. movie? WHAT IF THEY TAKE PLACE IN THE SAME UNIVERSE? 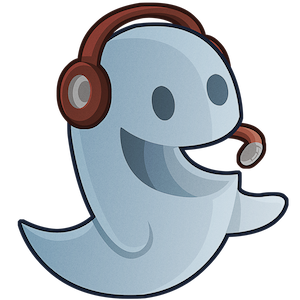 Want to be a part of Cheerful Ghost Radio? Come play Super Mario Bros. 2 with us! In season 3 of Cheerful Ghost Radio, we are starting our NES Classic reviews with Super Mario Bros. 1-3. Next up is the first sequel, Super Mario Bros. 2! Come play the game and discuss it with us, and we’ll include your thoughts in the episode! And by the way, if you don’t have an NES Classic or the original, but you do have Nintendo Switch Online, you can play it there as well! The Super Mario Bros. 2 we know in Western territories isn't the first game to go by that name. The first one (re-released later as The Lost Levels) was deemed too hard for us, so Nintendo reskinned Doki Doki Panic and released that as Super Mario Bros. 2 for us noobs in the west. Come play... Read All In season 3 of Cheerful Ghost Radio, we are starting our NES Classic reviews with Super Mario Bros. 1-3. Next up is the first sequel, Super Mario Bros. 2! Come play the game and discuss it with us, and we’ll include your thoughts in the episode! Come play Super Mario Bros. 2 with us this week and share your thoughts about it, including any thoughts you have about The Lost Levels release on SNES. This is the second in a three-part series about the Super Mario Bros. games on the NES Classic, so watch this space! We’ll have an event for Super Mario Bros. 3 in March! If you want to join up, hit the link below! Also, love that picture it looks like someone gave it a slight 3D effect or is the game naturally shaded like that? It’s an edited image but I think the shading on things was there for some objects. Super Mario Bros. 2 (along with Section Z) was actually the first Nintendo game I ever owned. I got it for my birthday at the same time as the system itself. My friends and I played nonstop for hours on end. @jaelte I never even heard of Section Z, I had to look up some gameplay. That looks like a fun intro to the autoscrolling shoot-em-up. We all know Super Mario Bros. 2 wasn't the follow up to Super Mario Bros. in Japan and that it was originally Doki Doki Panic and translated into English for an American audience. That reason being the big factor on why some Mario purists don't consider it a proper Mario game. Super Mario Bros. 2 celebrates it's 30th anniversary this year and as such Arcadeology has a focused retrospective on the game and it's history in the franchise. It's the deepest dive about Mario 2 i've seen to date and it showcases many of the improvements made over Doki Doki Panic. In fact, i'd say Mario 2 is superior to Doki in nearly every way and since Doki started out as a prototype for... Read All We all know Super Mario Bros. 2 wasn't the follow up to Super Mario Bros. in Japan and that it was originally Doki Doki Panic and translated into English for an American audience. That reason being the big factor on why some Mario purists don't consider it a proper Mario game. Super Mario Bros. 2 celebrates it's 30th anniversary this year and as such Arcadeology has a focused retrospective on the game and it's history in the franchise. It's the deepest dive about Mario 2 i've seen to date and it showcases many of the improvements made over Doki Doki Panic. In fact, i'd say Mario 2 is superior to Doki in nearly every way and since Doki started out as a prototype for Mario and then later was translated into a Mario game by a Mario team, it's a proper Mario game. Open to others thoughts here but Mario 2 is one of my favorite in the franchise because it's so unique and I don't think it standing out is any kind of weakness to it. Cygnus Destroy has a new Innocent Until Proven Guilty Video I wanted to share. I enjoy his take on the classics and have really enjoyed his series since I started subscribing last year. In his latest video he looks at Super Mario Brothers 2. Super Mario Brothers 2 is my favorite Mario game and only in the last few years did I discover the blow back this game has received. Some consider this not a proper Mario sequel because it existed first as Doki Doki Panic. Pretty sure when I was a kid it wouldn't have made the game worse and knowing that now gives the game a richer history but doesn't detract from it's charm or beauty. I know most of us consider Super Mario... Read All Cygnus Destroy has a new Innocent Until Proven Guilty Video I wanted to share. I enjoy his take on the classics and have really enjoyed his series since I started subscribing last year. In his latest video he looks at Super Mario Brothers 2. Super Mario Brothers 2 is my favorite Mario game and only in the last few years did I discover the blow back this game has received. Some consider this not a proper Mario sequel because it existed first as Doki Doki Panic. Pretty sure when I was a kid it wouldn't have made the game worse and knowing that now gives the game a richer history but doesn't detract from it's charm or beauty. I know most of us consider Super Mario Brothers 2 to be a great Mario game but I wanted to share this as the games controversy still marches on.... as strange as I find that to be. It isn't a *proper* Mario sequel but it was way better than the ACTUAL SMB2, by a long shot. They took a bad situation (the original Mario 2 got some blowback too, and the West would have hated it because we don't enjoy punishment in our video games the same way as the East), and a game they already had, and improved on Doki-Doki Panic AND made the Mario series better. 80s Reruns Double Feature: Super Mario Bros. 2... twice? Before leaving Mario behind for a while, I wanted to take a look into one of the most confusing situations involving a game's trip from Japan to the US, or rather two games. After the major success of Super Mario Bros., Nintendo released Super Mario Bros. 2 in Japan. The game was meant as a continuation of the first more than a typical sequel, so that it would be challenging for people who had already mastered the first game. The graphics were basically identical, but it introduced a couple of new mechanics and seriously hard levels. However, Nintendo of America decided they didn't want to release it stateside, since it looked too similar and would be too hard for... Read All Before leaving Mario behind for a while, I wanted to take a look into one of the most confusing situations involving a game's trip from Japan to the US, or rather two games. After the major success of Super Mario Bros., Nintendo released Super Mario Bros. 2 in Japan. The game was meant as a continuation of the first more than a typical sequel, so that it would be challenging for people who had already mastered the first game. The graphics were basically identical, but it introduced a couple of new mechanics and seriously hard levels. However, Nintendo of America decided they didn't want to release it stateside, since it looked too similar and would be too hard for western audiences. Interestingly, as the reworked Doki Doki Panic was selling well in the west as Super Mario Bros. 2, it was then RE-released in Japan as Super Mario USA. Down the line, when the Super Nintendo came out, with the release of Super Mario All Stars, the west finally got a peek at the original Super Mario Bros. 2, where it was called "The Lost Levels" instead of its original name, to prevent confusion. So, now that the history lesson is over, lets dive in, first with the Japanese version. From here on I'll just call them SMB2J and SMB2A so you know which one I'm talking about. SMB2J is hard, as I mentioned before. For this piece, I played the original on a Famicom emulator, and that made it a bit harder still, since the Lost Levels rerelease added a few things to make it easier, most notably being able to save your game. I used save points, a lot. I normally don't care for emulator save points because it makes things so much easier, but for this game I didn't consider it cheating. In terms of game mechanics, a few notable things changed. There's only a one player game, but you can choose between Mario and Luigi. For the first time, Luigi handled differently, being able to jump higher but handle a little more loosely. Also, the poisonous mushroom was added, which will kill you if you're small, or shrink you if you're Super Mario. In addition, the wind. Anyone who has played this game hates the wind. You know how to time your jumps, but then wind throws you further or prevents you from jumping as far. When you beat the game, if you haven't warped, you will go into a "fantasy world" called World 9. It's a "What if" world, where the overworld is flooded, or you have to beat bowser to get to the flagpole, etc. Unfortunately it just keeps going in a loop and doesn't allow you to get to worlds A, B, C, and D. On the famicom version, you have to beat the game 8 times to access these. In the Lost Levels, they just continue on past world 9. So what did I actually think? It's hard. It's good, don't get me wrong, but if I was a kid looking for something to play on a Saturday afternoon I doubt I would have picked it up, because it's nearly the same gameplay as SMB and the frustration would have made me leave it on the shelf. I can definitely see why Nintendo of America didn't want this. As an adult, though, I totally dig it. As long as I can use emulator savepoints! There are some truly challenging things that have to be pixel perfect to pull off. SMB2A, on the other hand, brought some major changes to the series. Luigi's gameplay changes remain, because the character he was replacing from Doki Doki Panic had the same abilities. The Princess (my fave) couldn't jump as high or run as fast, but she could float, and Toad was a brute, able to throw enemies farther than anyone, and pick things up faster. And wait, what? Jumping on enemies doesn't kill them! You just ride them until you pick them up. You can only kill enemies by throwing objects or other enemies into them. Another thing you notice is that all the enemies are different. You're thrown into a place that's obviously not the mushroom kingdom, with new unpredictable enemies. But once you get the hang of things, you feel right at home. Miyamoto obviously borrowed some physics from SMB, which helps the transition. Even though not originally a Mario game, this is the first Mario game to have worlds based on different climates (unless you count wind). The ice world was frustrating, but I can still remember the pattern of those flying guys with pitchforks when you're running down that long path of ice cubes, sliding all over the place. This trend of worlds in different climates is something that continues on to this day in the Mario series, and many other games. SMB2A is probably tied with the original SMB as my second favorites of the series, behind Super Mario World. Even if SMB3 went back to the old style game mechanics, leaving most of SMB2A's behind, I still find it quite appealing. Maybe that's part of why I like it as much as I do: It's truly unique in the Mario series, and hasn't had a chance to get diluted at all. So many major gameplay changes, all the enemies were different, but we still accepted it as a Mario game, because it's incredible. This game felt totally fresh, and everything just worked. The plot explained it all away as a dream at the end, which makes it fit into the chronology easily, but not everything was left in dreamland. Pokeys, Shyguys, and especially Bob-ombs have become a major part of the Mario series, and it's all thanks to the original SMB2 being too hard. I'm glad that as an adult I get to play both these games, but I'm definitely glad that 8-year-old me got the American version. 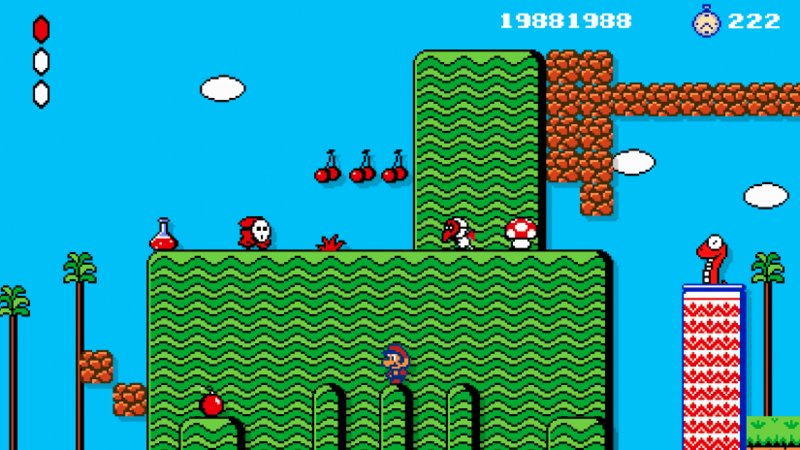 I'm aware of the history of SMB2, but I don't know if I've ever even tried "The Lost Levels." From what you describe, I'm sure I would absolutely hate it. The reason is because Mario games often get me too frustrated. Honestly, though, SMB2 (American version) didn't really do that to me. I really loved that game. I think the Princess was also my favorite. Her ability to float made things a bit easier. The history of the game reminds me of the Final Fantasy (SNES) history and how the Japanese and American versions differed. It's cool, though, that in both game series, both versions of the games were later made available. Another fun article, I look forward to more! That's great. I've said before Super Mario Brothers 2 is my most beloved Mario game. That said, Super Mario World may very well be the best as it's so freakin' polished. I've played the lost levels on the SNES Mario All Stars Kart and I never really played more than one or two levels. Like you say, kid me wasn't into the grueling difficulty as it wasn't that much fun then. When you play it with emulator save points, it becomes like Super Meat Boy. You have unlimited tries to pull off nigh-impossible feats. I have really great memories of SMB2. But I had a friend who's parents were friends with my parents, so when the families got together, all the kids would go into the tv room and play this the entire time. It was simple enough for my younger siblings to enjoy, and great enough to keep all of our attention for an evening. I don't mind where they are going with that but it would be stated differently in 2015. Nintendo Power's first issue was released for free to certain fan club members and in stores July of 1988. At the time Nintendo was gaining more and more traction as a pretty big household staple and to further it's reach they decided to start one of the greatest things to happen to the late 80's and 90's, Nintendo Power magazine. I first read this issue at my cousins house and immediately wanted a subscription. Nintendo Power was filled to the brim with comics, news and tips for all the games I loved. I have recently started re-reading them and decided to review them as I have time. Nintendo Power issue 1 contained some of the best art on a magazine cover I can think... Read All Nintendo Power's first issue was released for free to certain fan club members and in stores July of 1988. At the time Nintendo was gaining more and more traction as a pretty big household staple and to further it's reach they decided to start one of the greatest things to happen to the late 80's and 90's, Nintendo Power magazine. I first read this issue at my cousins house and immediately wanted a subscription. Nintendo Power was filled to the brim with comics, news and tips for all the games I loved. I have recently started re-reading them and decided to review them as I have time. Nintendo Power issue 1 contained some of the best art on a magazine cover I can think of. 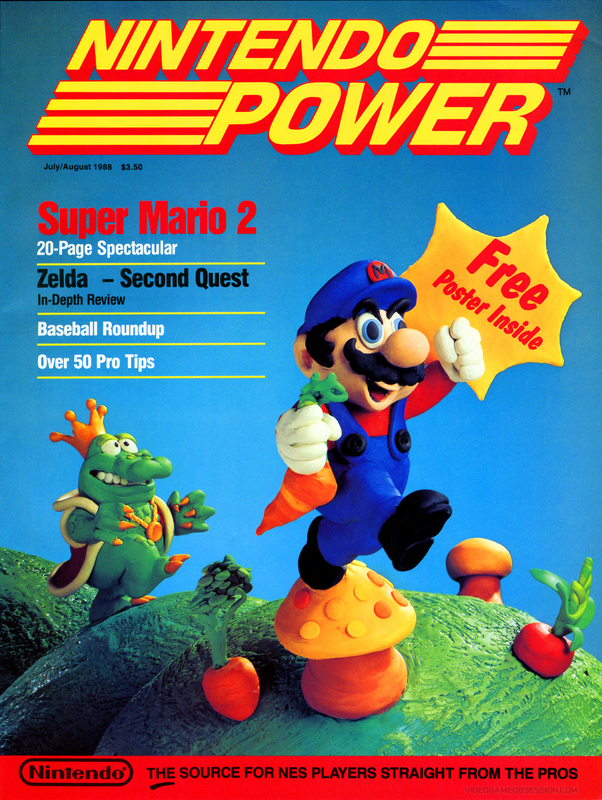 Featuring a clay scene of Super Mario Brothers 2, Nintendo Power issue 1 contains 20 pages of Mario 2 walkthrough magic. This issue also features a really interesting walkthrough for most of The Legend of Zelda second quest. The Zelda second quest walkthrough doesn't cover the last few levels of the game but follows up with the remaining information in issue 2. Compared to a modern magazine, Nintendo Power is pretty big considering issue 1 shipped as 113 pages. Nintendo Power featured a fold out poster in each issue and I enjoyed putting the cool ones up on my wall. This issue shipped with a poster for Super Bases Loaded which ranks it pretty high in terms of the most lame posters featured in Nintendo Power. Counselors Corner has tips for a few released NES games such as Metroid, Ghosts and Goblins and Super Mario Brothers. I am curious how well known certain video game secrets were before Nintendo Power published them. The infamous Super Mario Brothers 1-up trick is featured in this issue but I remember first hearing about it from a friend. One staple that I loved was the Howard and Nester comics. Howard was the comic character from the real life Howard Phillips, spokesman for Nintendo at the time. I am not sure if Nester was based on any real life person, but he was always snarky and fairly prone to doing dumb stuff. I always enjoyed reading each comic even though they don't hold up as well as my memory of them. Issue 1 goes on to drop the classic Konami code for Contra and provides information and walkthroughs for Gauntlet, Double Dragon, Contra & Jeopardy. The last bits of the magazine feature some interesting fan letters and the Top 30, a list of the most popular NES games. As issue 1 shipped, the top 5 NES games were The Legend of Zelda, Mike Tyson's Punch Out, Metroid, Super Mario Brothers & Kid Icarus. As Nintendo Power continued on and other games launched this list changed a bit, but Zelda was nearly always at the top of this list even after the Super Nintendo launched. At the time this issue shipped an entire year of Nintendo Power cost $15. This seems like a steal now but at the time was something I didn't have an easy time doing. That said, it didn't stop me from reading as many issues as I could get my hands on. I miss Nintendo Power! I thought it was always excellent and the best. I only briefly had a subscription many years ago. My only remaining request is that Nintendo releases all the back issues in some form of DRM free download. "Its near impossible to pick a favorite Mario game, what games get left out and Aaron has a few top choices that normally are not in the top 3!" I like this list because it places Mario 2 quite high. I know, Mario 2 was Doki, Doki, Panic, but like the video states, that doesn't make it a bad game. Thing is, i'd love to see a new Mario game riff Mario 2 ideas and have been bummed it hasn't happened yet. That said, this list is quite good and features a segment from YouTuber MetalJesus! So, you know, watch it. "Its near impossible to pick a favorite Mario game, what games get left out and Aaron has a few top choices that normally are not in the top 3!" That said, this list is quite good and features a segment from YouTuber MetalJesus! So, you know, watch it. Super Mario Land was fun but... I don't think it ages as well as some of the other Mario games. 6 golden coins was a bit better and it was still first generation Gameboy. 1. Super Mario Galaxy. Yes, really. More than World, more than 64, this game is amazing. 6. Super Mario Bros (although I have probably played this more than any other. I got my speedrun down to 6 minutes without tool-assist before I realized I could be playing more games instead of playing one over and over). n. Super Mario Sunshine. Again, all the main games are really good, this one included, it just never clicked with me. Why doesnt anyone have mariokart? Sunshine was actually pretty great too. But all of them are fantastic. Oh man! I totally forgot to list the Mariokart games! MarioKart is great, no question. The original is great too and next time I think about a Mario game I will include it. I've been thinking of dedicating a day of the week to a game topic close to my heart. I think Tuesday works because its a pretty boring week day in need of some love. I hereby dub Tuesdays "Retro Tuesdays and as such, each Tuesday I will write about a sweet game of yesteryear that I love or hate and was iconic for me in some way. 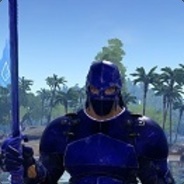 I would be awesome if others grabbed some good or ill feeling out your mind and posted it on Tuesdays as well. See how that goes. Without further ado..... "RETRO TUESDAY POST NUMBER A!" Super Mario Brothers 2 is a game I will never stop loving. First off if you compare it to the rest of the original Super Mario Brothers games its a total odd... Read All I've been thinking of dedicating a day of the week to a game topic close to my heart. I think Tuesday works because its a pretty boring week day in need of some love. I hereby dub Tuesdays "Retro Tuesdays and as such, each Tuesday I will write about a sweet game of yesteryear that I love or hate and was iconic for me in some way. I would be awesome if others grabbed some good or ill feeling out your mind and posted it on Tuesdays as well. See how that goes. Nintendo released Super Mario Brothers 2 as we played in the USA because the original was seen as too difficult. Whatever the reason I am glad they shipped the game as I played it because the game is wonderful. The art style is very good, the music is iconic and the story is the best from my memory for a Mario game. Super Mario Brothers 2 shrugged off the princess saving in favor of saving the world of Subcon from the evil Wart. Right, Super Mario Brothers 2 didn't feature Bowser as the badguy. Super Mario Brothers 2 went so far as to allow you to jump on a bad guy(which didn't kill them) pick them up and toss them as a weapon. I also loved the magic potion that allowed you to enter a special dark world where you could find mushrooms to allow you more life and collect coins and enter warp zones. Super Mario Brothers 2 also allowed you to pick what who the main character was. In Mario games typically you could only be Mario unless you were player 2 or in later Mario games 2-4. Super Mario Brothers 2 allowed you a choice between Mario, Luigi, Toad and the Princess. This is the only game to my memory where Mario was the worst character to chose as all the others were better in some way. To my memory Mario was kind of average, Luigi could jump very high, Toad was fast and the Princess could float. The character I picked 99% of the time was the Princess, she was mad overpowered and the game was so much easier when you played with her. I recently went back to Super Mario Brothers and played the Super Mario All Stars version. Basically, All Stars is Super Mario Brothers, Super Mario Brothers 2, Super Mario Brothers 3 and Super Mario Brothers the Lost Levels. The SNES style graphics really make those games shine plus they add a save feature the original NES versions lacked. When I think about awesome games that I love Super Mario Brothers 2 often comes to mind. I've played it recently so I know it still holds up well for me now. I often wish a modern Mario would pull elements from Mario 2 but it seems that Mario 2 will be off on its own which is just fine to me. I know others share my love for this game because of its uniqueness but we are a rare breed. A few years ago I took my love to another level and purchased this shirt. Yeah, I love the game that much. If you want a really weird feeling, grab a famicom emulator and a Doki Doki Panic! rom. It's so weird to play what I always thought of as SMB2 with entirely different characters. What we came to know as the Lost Levels was freakin' hard though. Like, painfully hard at times. I understand why they rebranded Doki Doki Panic! as SMB2 for the US. Thats a fun idea, I'll play it sometime. The lost levels was hard I don't remember getting much further than the first few levels. At any rate, it was always so weird going from 1 to the US version of 2 and then 3. The style changed so drastically to 2, and then back to a more Mario formula for 3. It was actually kinda comforting to me when I realized that the SMB2 I knew and loved was originally a different game entirely, because I always wondered why they changed things so drastically. They explained it in the end with it all being Mario's dream, but that explanation fell flat for me. Doki Doki Panic is actually a little harder than SMB2. To properly beat the game, you have to beat it with all four characters. Some of the look of SMB2 (US) is explained by the origins of Doki Doki Panic. The game took place in an Arabian storybook (thus the Arabian setting for much of the game, and the level intro screens being pages from a book). It's a family of 4 (thus the 4 characters) trying to save captured children. Overall I'm glad they rebranded it. I'm glad we got what we knew as SMB2, even if it wasn't quite accurate, because I doubt I would have ever played a game called "Dream Factory: Heart Pounding Panic" and SMB2 is one of my favorite games of all time. WhiteboySlim: Which is why SMB2 is so interesting, Mario isn't that great. Kind of a nice change actually as it focuses less on Mario and more on the four characters or whatever you prefer. Kind of didn't like that about New Super Mario, you had for characters and they all played the same. I enjoyed SMB2 as well. I think I liked playing as the Princess because she could float through the air, although I knew that Toad could lift things such as vegetables quicker than anyone. In played her for darn near every level except a few with Toad and Luigi. LOL, Jon, you've got me wishing this were more like Facebook and I could "like" a comment or post. Hehehe. But anyway, you know what, this reminds me of Final Fantasy X-2. It seemed a LOT of people complained about that game, but I wasn't one of them! I had no problem with playing as one of the ladies of FFX. Heck, I enjoy playing as ChunLi in Street Fighter, just because I like to see women more than men. LOL As for the Super Mario Bros. world, the Princess (whether it be Peach or Daisy) was about all the female characters we could see or play as on screen.